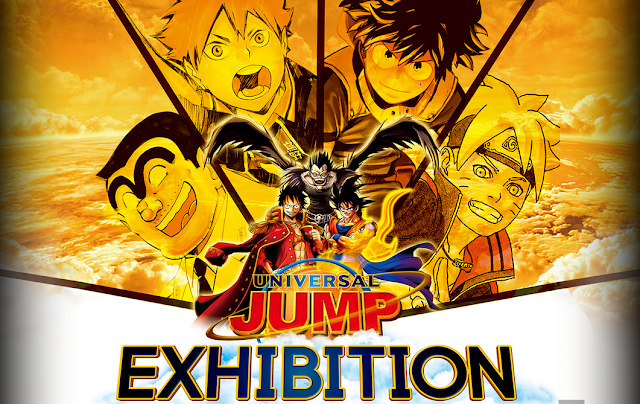 Looks like Universal is thinking of all sorts of ways to exceed park capacity, so not only do we have events for One Piece, but also Dragon Ball Z AND Death Note. Let's look deeper into the details that have been released so far. Welp, I hope you enjoyed the escape games for Resident Evil, because they aren't done with these yet! 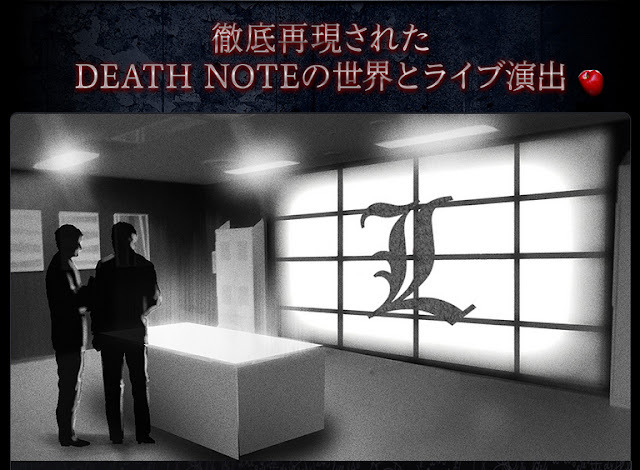 You'll be put into a team of 4 where you have to work together with L to solve puzzles and escape death, maybe? Like the RE escape game, this is technically an attraction separate from the park, so you will have to purchase a special ticket for this. They will be available for purchase on the USJ website (no information on whether you can purchase them in the park). I'm guessing this is an example of what the game area will look like. According to the description from USJ's site, you'll be running around a 4 story building called 'Sakura TV', following instructions from L, while you feel the presence of the God of Death behind you. 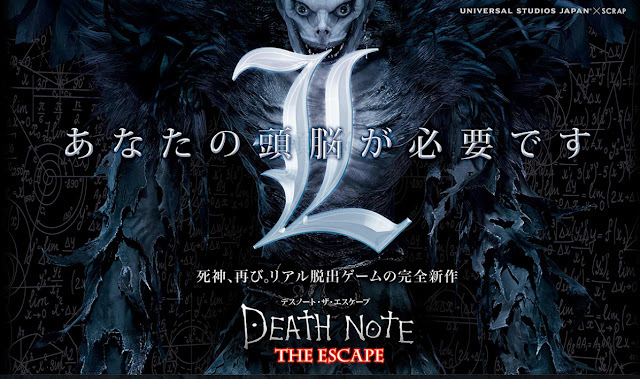 With a combination of realistic productions and live actors, you'll get to experience the world of Death Note as you try this solve this escape game. Tickets are on sale NOW and all dates are currently available. One ticket (any age) is 2980 yen （including tax), while pair tickets (a set of 2), are 7980 yen. 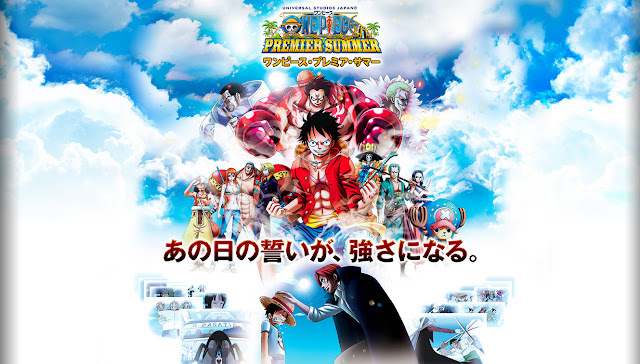 So far, it seems to include the 3 "attractions", One Piece Premier Summer (which is really its own even), a 4-D DBZ attraction and a Death Note attraction (probably along the same lines as the RE escape games from the past years). Experience a power level of 5.3 billion. 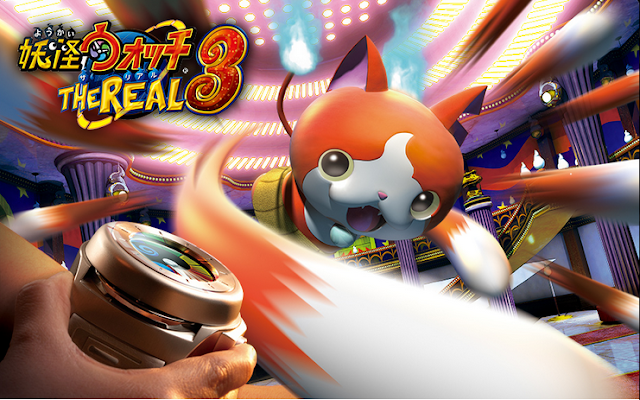 According to the site, this will be a 4-D attraction with its own original story (??) 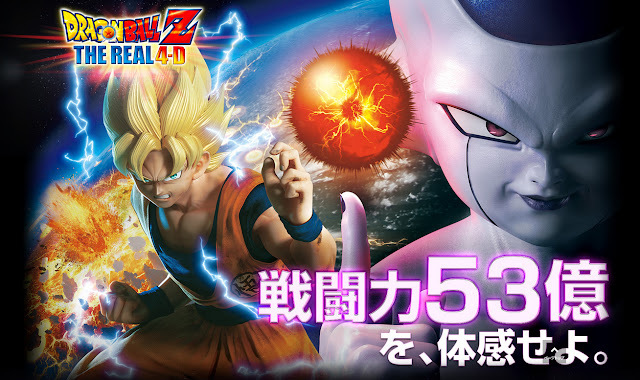 and battle between Goku and Frieza. We ALL know how it'll end, but I'm interested in what this 5.3 billion power level is. Because I didn't think power levels got much higher than the millions. And that's all we've got so far! I'll try to update again once they post more info. Details for the attraction have been released! It will be animated completely in 3-D with 4-D elements (lights, smoke, shaking chairs). It seems like tickets are not NEEDED for the attraction, but they are pushing their Summer Special express pass set. That means that if you go to the park to line up for the attraction, you'll probably be waiting in line for most of the day. Sadly, I'll have to recommend the express pass set if you want to see the attraction and get anything else done that day. 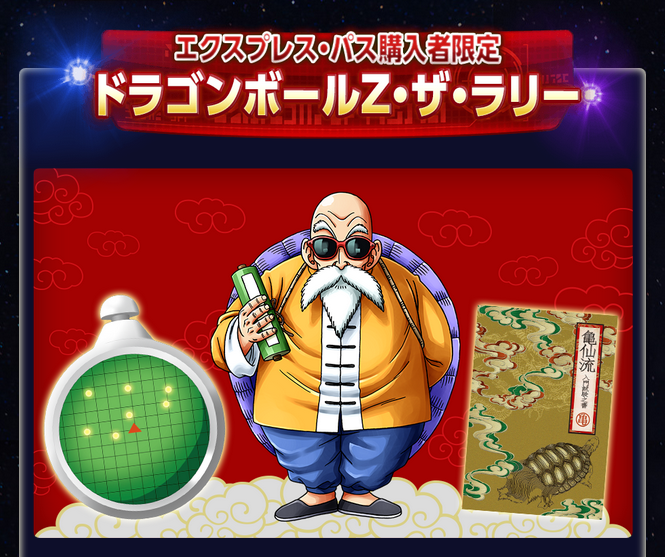 On the plus side, if you buy the Summer Special Express Pass -Dragonball Z- set, you get to participate in what looks like a Dragonball Z treasure hunt for the dragonballs called Dragonball Z The Rally. The event runs from 10:30 am until 7:30 pm (or 7:00 pm, depending on what time the park closes), lasts for bout 70 minutes, and winners do get a prize (however, you cannot choose the prize and it's not for resale, like that's ever stopped anyone though). Summer Special Express Pass -Dragonball Set- retails for 2,400 yen and comes with the dragonball reader, while the Summer Special Express -Universal Jump Summer Set- retails for 8,900 and includes entrance to all the the Shonen Jump attractions/events. More ticket info will be below! In this exhibition area, you'll be able to check out some development art, trick, and quizes about your favorite Shonen Jump titles. It's not an attraction per se, but it will likely be a lot less crowded than other places and could serve as a nice spot to kill time. Current series list for the exhibition. There will be 7 Shonen titles on displayed: こちら, 飾区亀有公園前派出所 Kochira Katsushika-ku Kameari Kōen-mae Hashutsujo (AKA Kochikame), Dragonball, One Piece, Death Note, Haikyuu! 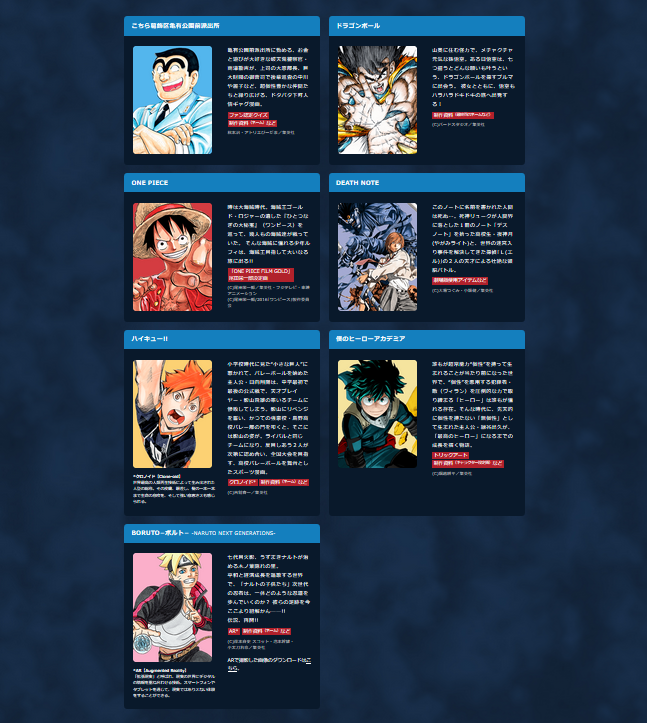 !, 僕のヒーローアカデミア Boku no Hero Academia (My Hero Academia), and BORUTO -Naruto Next Generations- (not food, but definitely sounds like it). Most of them just seem to feature developmental artwork from the series, but My Hero Academia has some trick art, Haikyuu will probably have life-sized figures of the character(s), Death Note will have a display of items used from he theatrical production, and BORUTO will have some AR photo ops. This exhibition will be right next to the entrance of the park and the exhibition will run from July 1st until September 4th, no tickets required. That day's vow becomes a new strength. 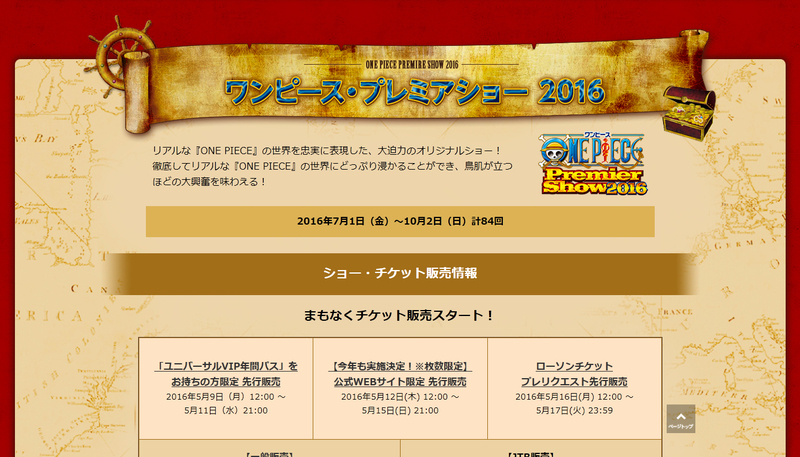 The attractions listed on the site at this moment are the One Piece Premier Show 2016 and Sanji's Restaurant as tickets for these two events will go on sale first. Tickets to these events are separate from park entry and can be purchased in advance online, or at the park (I don't recommend park purchases for Sanji's Rest as that sells out pretty fast!). This is like a mini, indoor version of the premier show, that also includes food! All the actors mime to the actual voice-actors' voices being played over the speaker, and interact with the guests. If I had to choose between going to this event or the premier show, I'd definitely choose this one! Tickets 4980 yen for adults, 2550 yen for kids, with 5 shows a day, 80 minutes each. At the end of each show, you can take 2 photos with the Mugiwara crew, one on yuor own device, and one with that park's camera. The photos will be available for purchase after leaving the event. Ticket sales begin on Friday, May 20th at 12 PM, WEBSTORE ONLY. 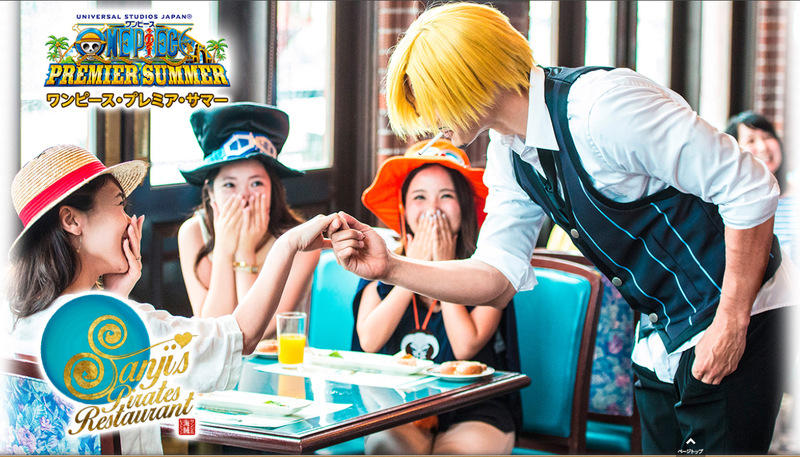 The only other way to get your hands on Sanji tickets is by going to the park, and even then, you can only buy tickets for that day, not any other day. Check ticket info (Japanese only) here. Well, the only info up so far is when you can buy tickets. No updates on who's to appear or what the story will be for this year yet, but an update should be coming later on this month! I'll try to add it to this post. Tickets can only be purchased in-advance on USJ's website and eventually at convenience stores in Japan, but pre-sale tickets start with season pass holders, so you might be a little SOL if you wait to buy your ticket at the park. The above image lists the ticket prices based on the seat you choose. 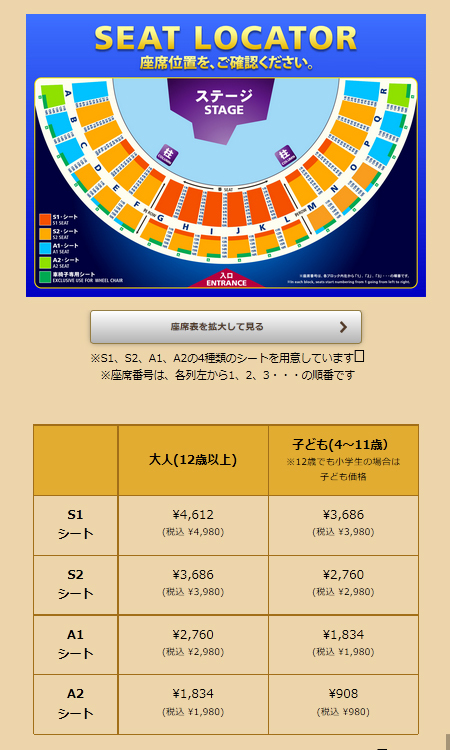 The seats closer to the stage and in the center are all S1, so they'll run you 4980 yen for adults, 2550 yen for children. The cheaper seats are 1980 yen, 980 yen respectively, but they'll be toward the back and maybe behind a pillar. Choose wisely. Tickets are now available for purchase online ONLY. The online presale will end on May 15th, after which, they will be available for purchase at Lawson as well. All dates except for July 1 are available. For other dates, I checked seat availability, and it seems like S1 seats (the seats closest to the stage) are already sold out. S2, A1, and A2 are still available. Regular ticket sales will commence on May 20th, by which all of the S seats will probably be gone, so if you want to be anywhere near the action, get a ticket now! Sabo should be making an appearance this year! Squee!! Okay, this event, to be truly honest, is adorable! I checked it out last year with some friends, and though it was the cutest. 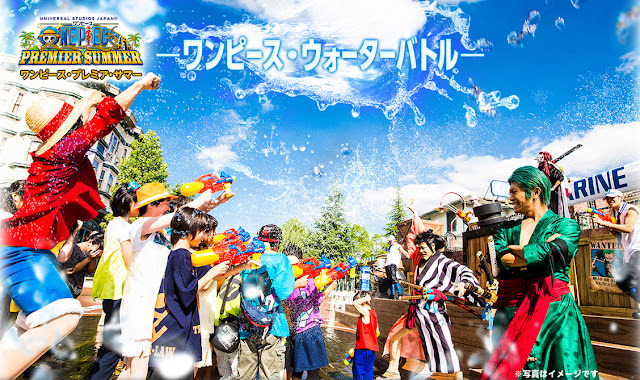 Basically, some of the OP actors come out and have a water gun fight with kids. I don't know if adults are not allowed to participate, but I didn't see any sitting down on the ground with the kids. 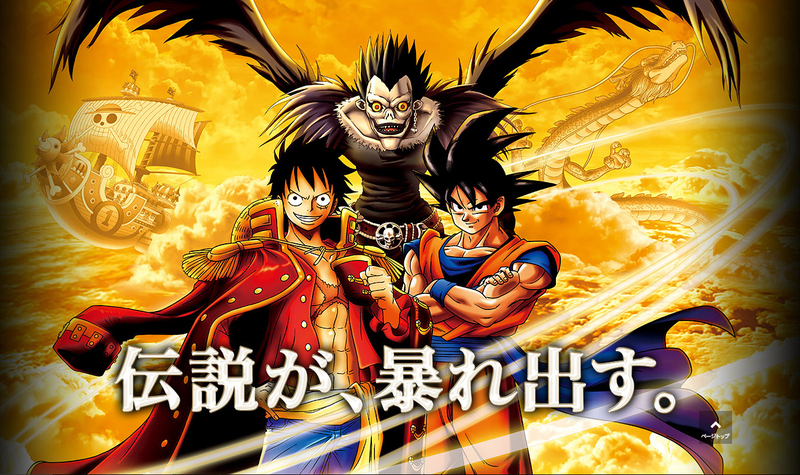 Last year, it was Zoro, Luffy, Kin'emon and some Marine officers (basically, the photo above). But I did take video of the event, so I'll be sure to edit it up to show you guys! This event runs 4 times a day, so if you're not able to tickets to the premier show or restaurant, then definitely check this one out! You just have to stand in the right area until they start! So I totally forgot about this event! 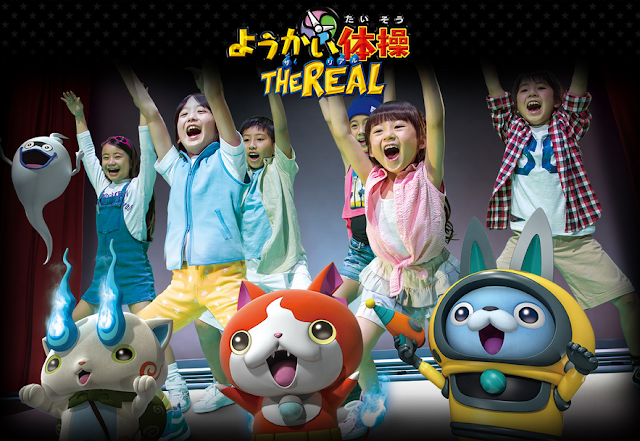 It's been all over TV because kids watch TV and kids love Yokai Watch. I've only ever watched it with my niece and nephew, but the characters are super adorable and I bought a budo-nyan (grape cat-thing lol) from USJ last year, so I wouldn't mind checking this out. It seems to have been broken down into 4 attractions/events. As the name suggests, this is not the first time USJ has done this event. I didn't participate in the previous ones, but this year's attraction appears to take in America (oh gawd). As this attraction is mainly for children, they made a special "children's ticket" that will be given out to kids in elementary school or younger. This ticket is free but is limited to certain number of children per day, so once they run out, it's finished. You can still try to wait in line for the attraction, but there's also no guarantee that you'll get to participate. For this attraction, each group of 3 will be given a Yokai Watch and Yokai Pad, one of each, so families of 3 or more will probably have to split into separate groups. Groups of middle school ages kids or older will cannot obtain or use a "children's ticket" but they can purchase the Summer Special Express Pass -Universal Yokai Watch Festival Group Set- to participate. You're also free to line-up the day-of, but there are no guarantees on the wait times (the attraction time is only 25 minutes, but, you know, kids). So if you know Yokai Watch, you know that one of it's biggest draws is the easy to mimic 'yokai taiso (yokai exercise)' that was played during the TV show. This show attraction is a way for people to meet their favorite yokai characters and dance/exercise with them (to be honest, I bet that's pretty adorable). Unfortunately, there are a few rules that have to be observed during the show, mainly that photo and video are not allowed. This is probably for the best seeing as chaos usually ensues around yokai and cameras. 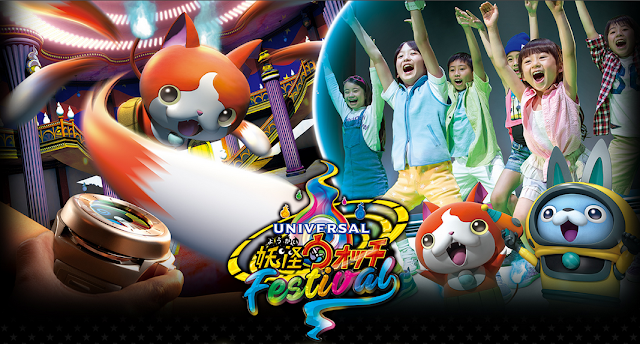 Entrance to this attraction is also available through the Summer Special Express Pass -Universal Yokai Watch Festival Group Set-. This is another pad attraction based in the Hollywood area of the park that is a scavenger hunt, much like the DBZ attraction (see what ya did thar USJ). Participants that finish this attraction will receive one of the two limited edition USJ original Yokai medals. Unlike the two previous attractions, there is a participation fee involved for visitors that aren't using the express pass set. The ¥1,000 yen ticket is available for purchase at the webstore (starting from July 4) or within the park. This ticket is included with the Summer Special Express Pass -Universal Yokai Watch Festival Group Set-, but I would assume that while the group has to share the pad, each participant will receive their own prize medal (I sincerely hope that is the case). This is an American-style restaurant (e.g. 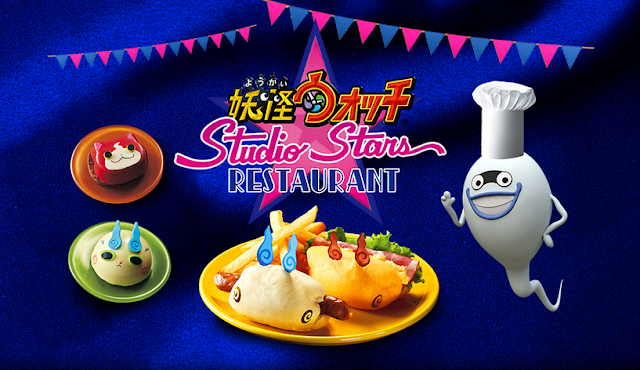 hamburgers and hot dogs) with a Yokai Watch theme. Whisper (the ghost with the purple lipstick) is said to be the head chef, though what he knows about American dishes is a mystery. So far, the only dishes announced are a lunch box set with a hot dog, a ham and egg sandwich, and fries, plus two two mousse desserts. The others will probably be announced after the event begins. There are quite a few ticket packages available for all the events going on this summer, so I figured it would be easiest to write the names, prices and links all in one place. All the USJ official webstore items are only available in Japanese. 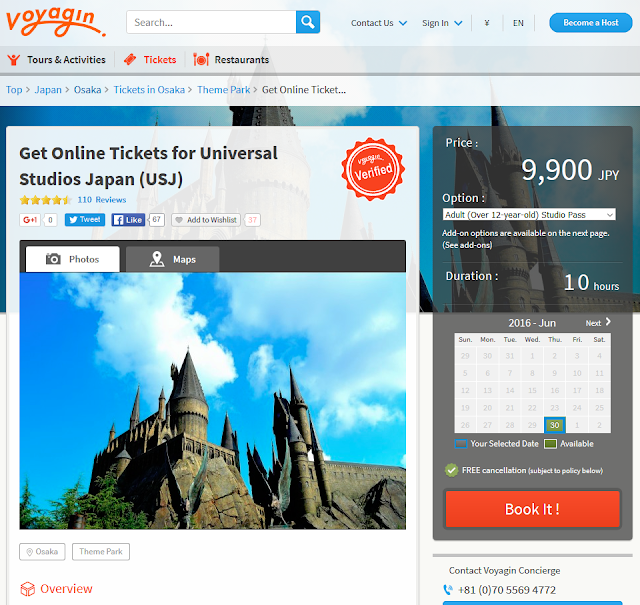 For websites that are selling tickets in English, please check out Voyagin below. This one is the most expensive as it includes tickets to the following attractions: Dragonball Z The Real 4-D, One Piece Premier Show 2016, and Death Note The Escape. This ticket "set" only provides you with a ticket to the Dragonball 4-D attraction, but it comes with a lot of freebies, so I guess that's why they call it a set. 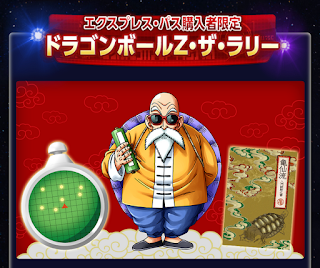 You get a booklet, that let's you participate in the dragonball treasure hunt, and a dragonball reader, but you want be able to enjoy any other attractions with this set. The group ticket set is for a group of 3, and includes entrance to two of the Yokai events (Yokai The Real and Yokai Workout). The group also receives a Yokai pad for the scavenger hunt and a limited edition original drink present. Perfect for families of 3, but maybe a bit troublesome for bigger families. This express pass set does not include entrance to any of the limited-time attractions. You gain faster entrance to the follow attractions: Hollywood Dream The Ride, Space Fantasy The Ride, and JAWS. The period of validity for this pass follows the same period as the Universal Jump and Yokai Festival events, so take care when shopping. This pass is also unrelated to the Universal Jump and Yokai Festival events, but it does include fast entry for new attractions like The Flying Dinosaur and the revamped Harry Potter and the Forbidden Journey (you also get special seats for the parade). If you're looking for an English-language service for getting your USJ tickets, check out Voyagin! They'll help you get your park tickets, plus they have extra options for the Summer Special Express -Dragonball Set- and Summer Special Express -Universal Jump Summer Set-, and they can get you train tickets for your trip to the park. If you need them to, they can even print and send your tickets to your hotel, but make sure to read the instructions on how.